Here are four very dissimilar scenes that have two things in common: they’re all examples of Hollywood’s idea of high-minded drama, and they all make me laugh out loud, no matter how often I see them. 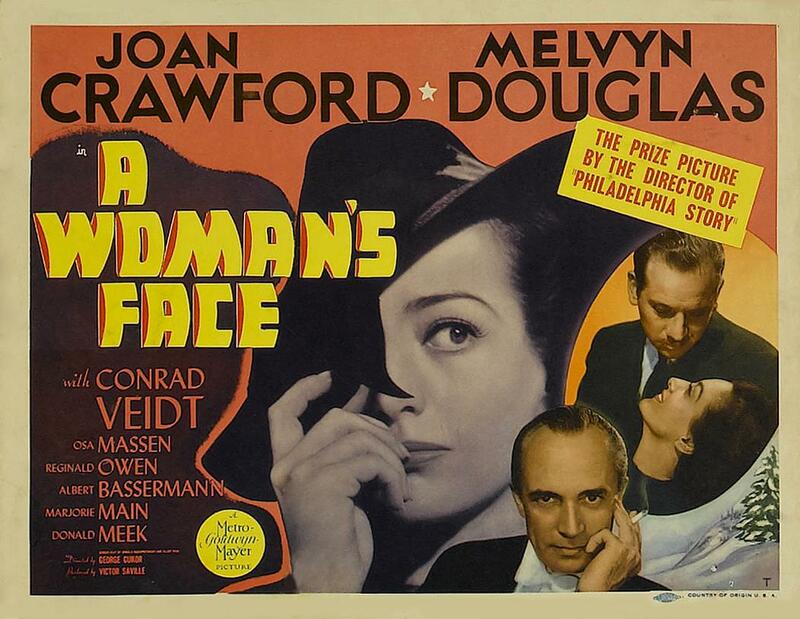 This first one is from “A Woman’s Face” (MGM, 1941). It’s hard to tell whether the screenwriter, Donald Ogden Stewart, was kidding around. He wrote a lot of the prestige pictures for Metro in the 30s and 40s, but many of the prestige pictures — “The Barretts of Wimpole Street,” “Marie Antoinette,” “The Philadelphia Story,” for example — are damned idiotic. If Stewart was kidding around with this little exchange, Joan Crawford certainly wasn’t in on the gag, but I’ll bet Connie Veidt was laughing on the inside. This happens to be one of my favorite exchanges from any picture. I have a great relish for full-speed-ahead wrongheadedness, so this following speech is one of my all-time favorites — I can’t even think about it without laughing. It’s Henry Hull as he tears a passion to tatters at the very beginning of “The Fountainhead” (Warner Bros., 1949). 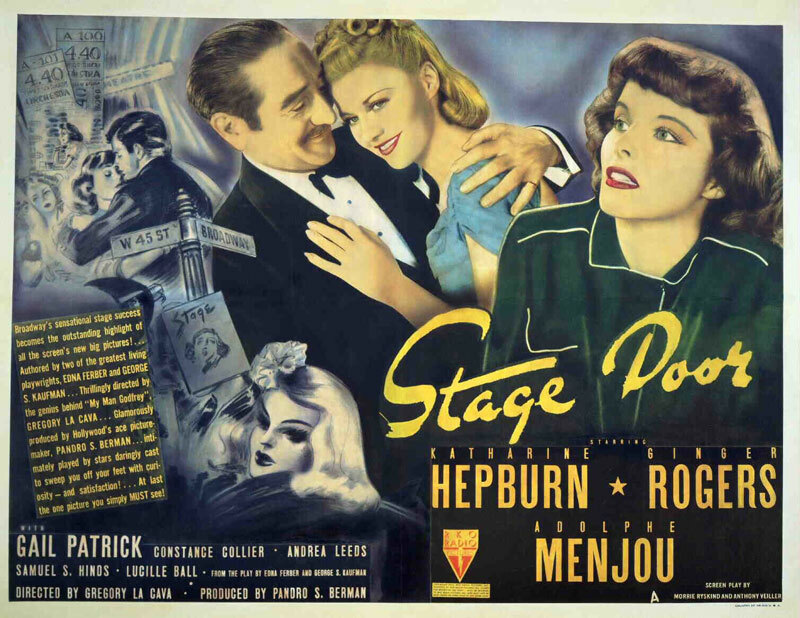 Ayn Rand insisted on writing the screenplay herself, so it was bound to be loaded with laughs. The whole picture is played at this fevered pitch — it’s a sustained temper tantrum that lasts one hundred and fourteen minutes. Ayn Rand’s rants remind me of a freight train highballing around a horseshoe curve: clattering, dangerously unbalanced and wholly unnecessary. 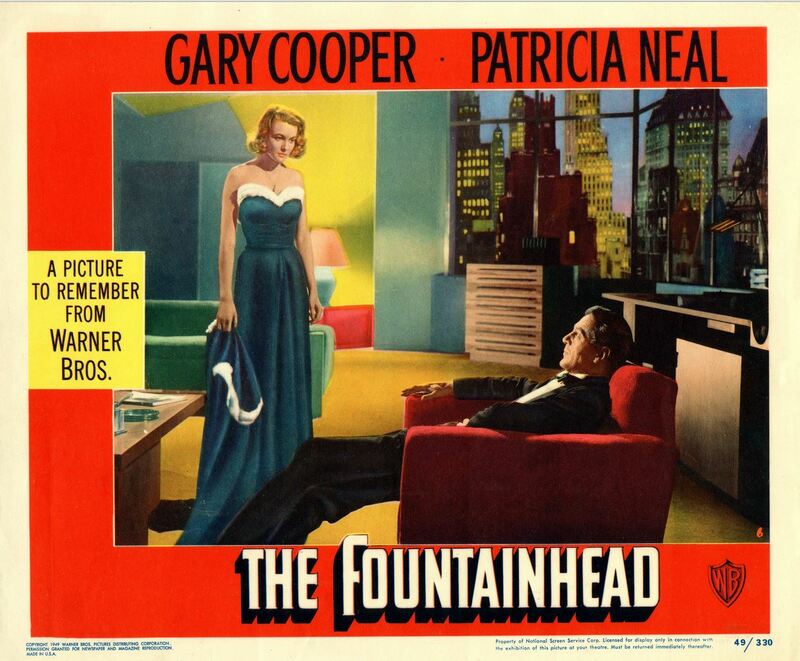 Don’t try to watch “The Fountainhead” in one sitting — the joke wears thin very quickly. Taken in small doses, however, it’s chock-full of chuckles. You can start watching at just about any point, and you’re almost guaranteed to see some hilarious nonsense tout de suite. At the end of this scene, notice how much trouble Gary Cooper has pronouncing his own character’s name — he almost chokes on his back-palate r’s. Notice, too, how crooked Hull’s bow-tie is . . . that kills me. What a shame they didn’t rig it so that it could twirl at every uptick in agita. Rand wrote only two other screenplays: “You Came Along,” a dopey romantic comedy starring “Love That Bob” Cummings, and “Love Letters,” a soapy melodrama involving murder, amnesia and an irrational dread of the mailman. Both pictures are idiotic, but her heart clearly wasn’t in the work — so they’re not nearly as funny or entertaining as “The Fountainhead.” I am full of ambivalence over this business of laughing scornfully at bad writing and wrongheaded acting, especially when it’s obvious that the people involved were wholly committed to their bad ideas. But that, of course, is what makes it so painfully funny: ever since (and, presumably, long before) the Rude Mechanicals performed “A tedious brief scene of young Pyramus/And his love Thisbe: Very tragical mirth” at the end of “A Midsummer Night’s Dream,” the mismatch of high-mindedness and ineptitude has been making audiences laugh. In the case of Ayn Rand, I feel no remorse at roaring with derisive laughter at every word she ever wrote. I feel no twinge of guilt about laughing at this one, either. Cobb was an incorrigible old ham and it makes me happy to see him tear down the curtains from their rings and stagger out of doors and fall face down into a mud puddle (it’s almost certainly a stunt double). I love the little aristocratic wave of his hand (like the Queen in her carriage) as he stumbles toward the patio doors, the damask curtains and thence to Eternity; I love the way he tries to out-bellow André Previn’s magnificent score; I love the hammy pauses he takes at the beginning while he revs up his engines. I hope you’ll take my advice and have a look at this picture. I have shown only a small portion of a much longer scene, and it is all hilarious — every important moment is punctuated by the most tremendous crack of sound effects thunder. There’s a lot of meat and fowl on the dinner table and a lot of hams seated round it. And there is that score, which it almost killed me to cut short (believe me, I didn’t want to). Once Cobb is dead and the story moves to Paris, the picture has little to recommend it, except for the score. It is beautifully photographed, but God is it ever dull . . . ! 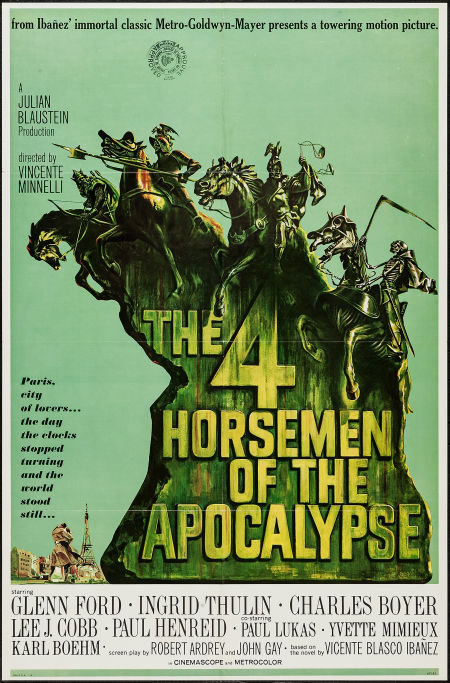 This entry was posted in Main and tagged 4 Horsemen of the Apocalypse, A Woman's Face, Andre Previn, Angela Lansbury, Ayn Rand, Conrad Veidt, Donald Ogden Stewart, Edna Ferber, Gary Cooper, George S. Kaufman, Glenn Ford, Henry Hull, Ingrid Thulin, Joan Crawford, Karl Boehm, Katharine Hepburn, Lee Cobb, Morrie Ryskind, Stage Door, The Fountainhead, Vincente Minnelli on May 2, 2013 by TR.